In a perfect world, we’d never have to plug in our handheld devices to recharge them. That gadget-reviving utopia is still a few years away, but in the meantime, Powermat offers the next-best thing with its Portable Mat and Home & Office Mat. Just place your worn-out gadget on the mat, and it starts rejuicing. Each mat can charge up to three devices using only one power outlet, eliminating that unsightly mess of cords cluttering your desktop or night table. 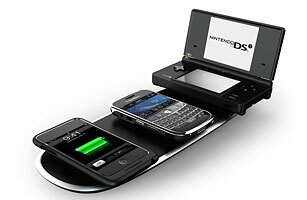 You’ll need to purchase Powermat receivers for each device (BlackBerrys, iPhone or iPod, Nintendo DS) or pick up the Powercube universal receiver, but it’s worth it for a simple system that’s one step closer to a completely wireless-recharging solution.